Push file server; share files between a group of users. Is there a better alternative to Push? Is Push really the best app in Servers category? Will Push work good on macOS 10.13.4? It lets you setup your own Push File Server. It's an awesome new way to share files between a group of users. NOTE: Please see our website for setting up instructions! Push File Server First of all what do we mean with a Push File Server? With normal file servers you need to login to the server, search for the file you need, copy it to your own computer and log out. Added Help pages. You'll be directed to our website where you can find documentation, installation guides and a FAQ. It was not possible to use an apostrophe. You would get an error of a wrong EOF (end of file). When changing a clients name it did not change it in the group members files. The log file is now better to read. Some other small bug fixes. Push needs a rating. Be the first to rate this app and get the discussion started! With Push it's the other way around. Instead of you going to the file server the file server now comes to you. The Push Server knows what kind of files you want to receive. And when it spots a file you want, it sends it to you. Right into your Drop Box. Share Files In A New Way Ever wondered what that Public Folder is doing in your home folder? It's meant for Push. 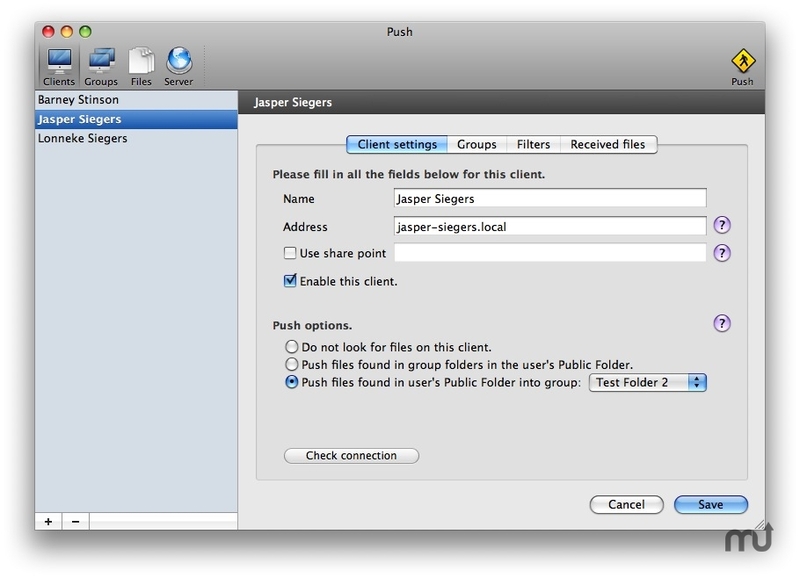 The idea is simple: whenever you want to share a file between a group of users simply put it in your Public Folder. Push will see it, get it and send it to all the users who want it. And when somebody else shares a file? You just receive it in your Drop Box located in your Public Folder.